They are found in rich woods. 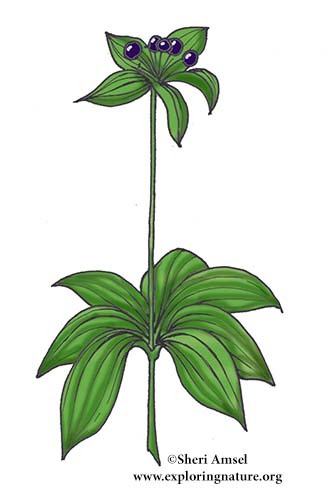 Plant is one tall stem with two whorls of leaves, one in the middle and one at the top below the flowers. The flowers are yellow-green and hang down between the leaves. They develop into dark berries later in the summer. Up to 2' tall – blooms late spring to early summer. Leaf Type: Lance-shaped in two whorls - one whorl is at the middle of the plant with 5-9 leaves and one whorl is at the top of the plant with 3-5 smaller leaves.